People use the connected devices they own, such as smart home appliances and wearables, as singular technologies, rather than as part of an ecosystem of networked devices. Over time, experts predict that connected devices will be easier to connect and more convenient to use, which will help people experience the benefits of IoT. Connected devices are how people experience the “Internet of Things” (IoT), the broad term that describes the global network of devices and objects that can be connected through internet networks. Currently, people own and use connected devices but not to their fullest “connected” potential. Instead, people often use connected devices as isolated, singular technologies, though they still benefit from them. This report is the first in a series about how people engage with emerging technologies. Businesses and developers can use this report to understand consumer sentiment about connected devices and IoT technologies. Smart home appliances are the connected devices people own and use the most. Two-thirds of people (67%) own a smart home appliance, and 49% use smart home appliances the most compared to other connected devices. More than one-third of people (35%) own a wearable device, and 27% own stand-alone, automated digital assistants. Over half of people (53%) do not plan to invest in a connected device over the next 12 months. A majority of people (64%) say they can accomplish their day-to-day activities without their connected devices, compared to 36% who depend on their connected devices to live their everyday lives. Access to important information (39%) is the primary benefit of using a connected device. Nearly two-thirds of people (64%) use their connected devices at least once a day. Only 40% of people are certain that their personal data is shared across multiple devices. Connecting to networks (19%) is the most common challenge people experience with their connected devices. One-third (33%) experience no issues with their connected devices. The majority of people have adopted connected devices into their homes. Just over two-thirds of people (67%) own a smart home appliance such as a Nest thermostat, smart lock, or smart TV. Other connected devices people own include wearable devices (35%) and digital assistants such as an Amazon Echo or Google Home (27%). Smart home appliances are also the connected devices that people use the most. Nearly half of people (49%) use smart home appliances more than any other connected device. Smart home devices allow people to create individual ecosystems of connected devices that they can control remotely from their smartphone, smart watch, or digital assistant. IoT Remote: Devices that enable people to control IoT devices, often a smartphone or personal computer. 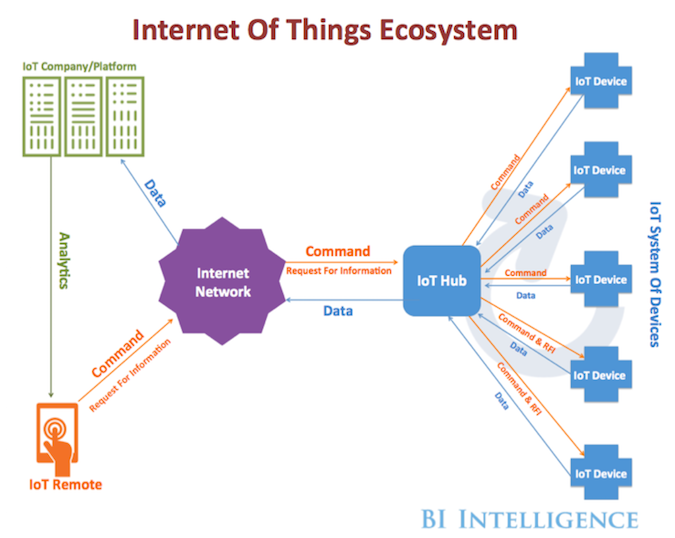 Internet Networks: IoT ecosystems rely on internet networks to communicate instructions between connected devices. IoT Hub: Central pass-through point that syncs IoT devices to each other. IoT Devices: Receive commands from IoT remotes to perform particular functions and share user data and instructions. Examples include smartwatches, digital assistants, and smart ovens. For example, through apps on your smartphone (IoT remote), you can set the temperature for your apartment on your smart thermostat (IoT device), turn on your smart oven (IoT device), and set your smart TV (IoT device) to your favorite channel on your commute home (using internet networks). For the most part, people don’t plan to invest in connected devices over the next year. Over half (53%) do not plan to invest in a connected device in the next 12 months. Only 14% plan to invest in a wearable device, and 9% plan to invest in a digital assistant. One reason people dismiss investing in connected devices is that they aren’t all compatible. The lack of compatibility between connected devices creates a disconnect between people who own IoT devices and the systems they connect their devices to. Barriers to entry such as reconstructing an entire home and re-configuring devices for connectivity present cost and maintenance challenges that disincentivize users from investing in connected devices in the future. Generally, people don’t feel they need their connected devices. Nearly two-thirds (64%) say they can accomplish their day-to-day activities without their connected devices. People don’t yet rely on connected devices to complete their daily routine like they do with their smartphones. “For some, connected devices are just nice to have. They could make do without them.” said Bob Klein, CEO & Founder of Digital Scientists, a software innovation lab based in Atlanta. Instead of treating connected devices as an integral part of everyday life, people often use their connected devices in isolation and for singular functions. For example, people often use wearable devices to check the time or their fitness. While these functions are useful, it's unlikely that their absence would disrupt someone's daily life. 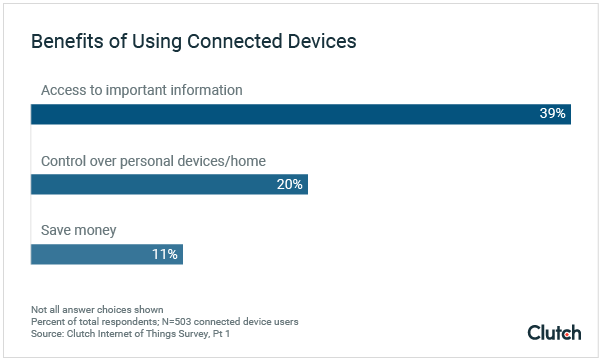 One reason why 64% of people say they can live without their connected device is that they don’t connect their IoT devices to each other. People who own a connected device understand they can sync them to existing technologies such as their smartphones and personal computers, but they don’t connect their wearables to their smart home appliances or digital assistants. Only 9% of people access the same applications on multiple connected devices. People sync their connected devices primarily to their smartphones (79%), personal computers or laptops (40%), or tablets (28%). People still are in the early stages of IoT adoption, so they have yet to realize the full potential of connected devices. “IoT is definitely still in the early-adapter stage with many consumers. I do not think that consumers are aware of the full potential and all of the benefits that IoT can offer,” said Jenna Erickson, marketing manager for Codal, a Chicago-based app developer. Some people still find their existing devices more convenient to use than connected devices. If a connected device is an inconvenient technology to use for a task, people won’t use it. Shylenok references a smart oven to illustrate his point: Regardless of whether you set the temperature of your smart on another device, you still need to physically go to the oven to put in or remove food. 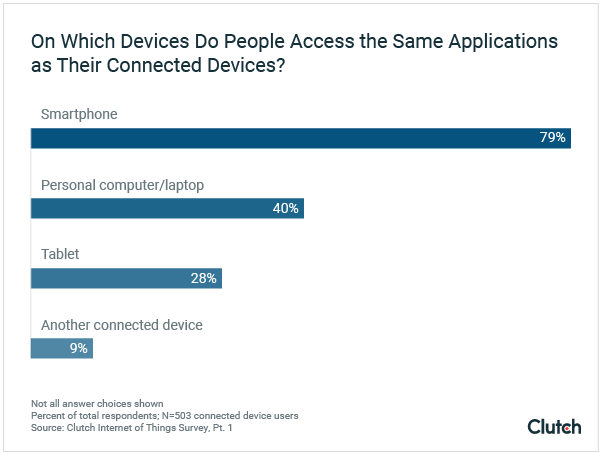 Even when a device has the capability to connect to other devices, people still may prefer to use it without the help of another device. Over time, connected devices will become a normal part of people’s everyday lives. Already, 64% of people use their connected devices at least once a day. Over one-third of people (36%) say they need their connected devices to live their everyday lives. In the future, most devices will connect to other devices, Klein predicts. When this occurs, people likely will use connected devices if given no other option. In the future, connected devices will be easier to connect across platforms in the future when the IoT infrastructures for platforms such as Google Home and Android are more available and affordable to product developers, according to Alexey Chalimov, CEO of Eastern Peak, a mobile and web development company based in the UK. "The cost of the internet infrastructure is important as well as the availability of the infrastructure for platforms such as Alexa and Google Home," said Chalimov. "It should be available to all manufacturers for their devices. It takes time, but we are headed that way." Allowing developers to create products and applications that can sync across platforms will make it easier for people to connect their IoT devices in the future. People use their connected devices as tools to access and share important information about their health, home, finances, and news. Nearly 40% of people say easy access to important information is the primary benefit of using connected devices. The more people depend on connected devices to access their personal information, however, the more open that information is to external parties, including developers, companies, and marketers. With expanded access comes privacy and data-sharing concerns, which are among the most serious drawbacks to using a connected device. Part of the concern about data privacy is people’s uncertainty about who has access to their data. Nearly one-third of people (29%) don’t know if their personal data is shared across multiple connected devices. 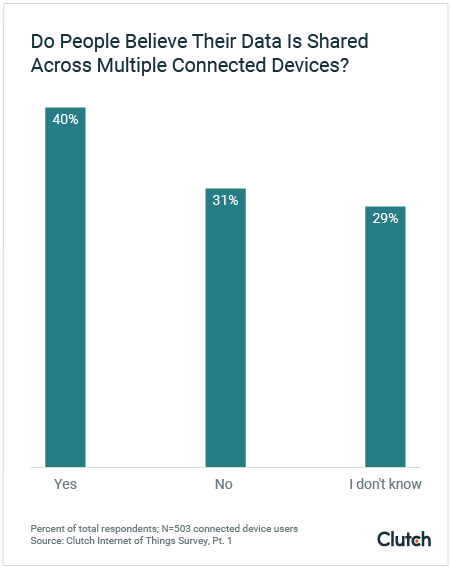 Forty percent (40%) of people say their data is shared across multiple connected devices. Only 31% of people are confident that their data is not shared across connected devices. This perception reflects a broader misunderstanding of how companies collect and manage consumer data, experts say. When people connect devices to each other, they allow data transfers. Applications or network providers then store this data, a fact that many people seem to not know. 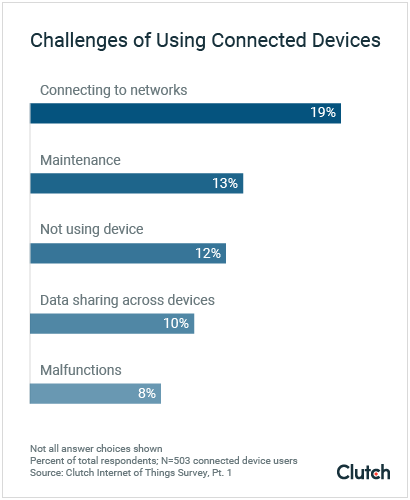 People struggle with their connected device connectivity and maintenance, but many still claim they don’t experience issues with their connected devices. One-third (33%) say they experience no issues using their connected devices. The primary challenges that people experience are connecting to networks (19%) and maintenance (13%) – for example, updating apps and charging batteries. People that depend on connected devices to accomplish their daily routine are more affected by challenges or malfunctions with their devices. People who depend on their connected devices are more likely to experience challenges such as connecting to networks (23%) and are less likely to experience no challenges (29%) with their connected devices. The more people that use connected devices, the more likely they are to experience challenges. People have yet to experience the full benefits that connected devices provide, particularly cost savings. For example, smart home appliances allow you to control the temperature of your home or other appliances remotely and only when needed. This helps reduce energy bills. While one-fifth (20%) enjoy the control their connected devices provide over their other devices and home, only 11% of people recognize cost savings as the primary benefit of using a connected device. Over time, as more devices are connected, solutions will become more affordable, said Oleksii Kuzmenko, Business Development Director for PLVision, an IoT software development company. “We see there’s really significant growth of such kind of [connected] solutions. Connectivity becomes easier as solutions become more affordable.” Kuzmenko said. "We can see a trend in industrial building management and automation companies moving into consumer space, proposing cost-effective, customized versions of their systems for residential space." Cost savings can be a benefit of connected devices, but consumers won’t fully realize them until they can easily connect their IoT devices. People own and use connected devices, or devices that can be connected from a remote device through the internet. These devices are part of the “Internet of Things” (IoT), the broad term that describes the global network of devices and objects that can be connected through online networks. 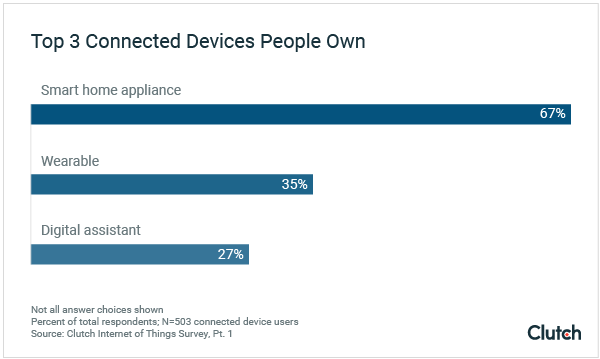 Smart home appliances are the most popular connected devices that people own and use: Over half of people have introduced some form of IoT technology into their homes. People aren’t completely sold on connected devices, however. Over half do not plan to invest in a connected device in the next 12 months. One reason they aren’t fully invested in connected devices is that they don’t believe they need them. As a result, people largely do not connect devices to each other. Less than 10% of people connect their IoT devices to another connected device, opting to connect devices they are more comfortable using: smartphones, tablets, and computers. Over time, experts predict that connected devices will become more popular when IoT developers create new products that need to be connected to other devices to achieve their full potential. With the increased presence of connected devices, people can experience the benefits of accessing important personal information from multiple devices. This benefit, however, creates challenges with data privacy. Clutch surveyed 503 people who own a connected device to learn about the IoT devices they own and use, use cases, and investment plans. Just over half of respondents (51%) were female, and 49% were male. Respondents varied in age: 10% are between the ages of 13-17; 28% are 18-34; 30% are 35-54; and 32% are 55 and above.